Cooler bag KILVESKA from 100% polyester, the cost of 399 rubles, will come in handy on a trip to a picnic or to the beach, and will also be indispensable on a hike. It would be good to take it with you in hot weather if you went to a remote grocery store. Wash KILVESKA It recommends manually at 40 degrees. Thermos for food EFTERFROGAD for 649 rubles (volume 0.5 liters) - a real find for lovers of long-distance travel, and if you are traveling with children - twice! The wide mouth allows you to conveniently fill the thermos and even eat from it, not shifting to the plate, of course, if the need arises. Drinks, soups, the "second" - it all perfectly preserved fresh and warm thermos EFTERFROGAD. By the way, do not worry if you accidentally dropped a thermos or it turned over during transport, the flask built into the EFFERFROGAD has impact resistance. The weight of the thermos is very small - 0.33 kg, the main part EFTERFROGAD stainless steel, and the cap and cork - polypropylene and silicone rubber, respectively. Bottle of water BEHOLLARE (Volume 0.6 L) for a ridiculous price - only 199 rubles, will help in the transportation of liquids in the road. It has a function neprolivajka through a sealed lid. Vodicka, drink or juice are always at hand in the journey, and the bottle diameter in cm 7 successfully "fit" in the stand for bottles in the car. 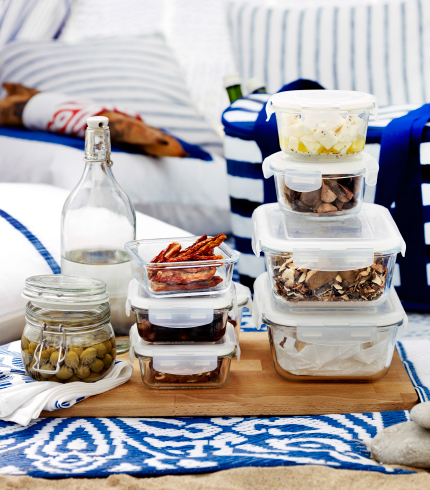 We found an incredible number of containers for food in IKEA catalog and even, frankly, it was difficult to give advice on exactly what would be useful on your journey. But, having narrowed the search for the cost and number of containers in the set, we quickly found the best option - containers Prouty. Total 329 rubles 17 (!) Containers, you see, this is a very pleasant shopping. The kit contains the Prut containers completely different sizes, which will take to the road, not only ready-made meals, but also the ingredients for them. Set formed as a nesting doll, which further emphasizes its functionality, not only on the road, but when used at home. Containers It can be washed in the dishwasher, heating them food in the microwave oven and subjected to freezing. What can I say - they are universal! PS For those who do not like to eat from plastic dishes, there are options of containers made of glass. For example, among the containers in the low price category we find FЁRTROLIG for 169 rubles. Of the positive characteristics FЁRTROLIG call flip lid sealed and heat-resistant transparent glass. Case for wireless charging VITAHULT ideal for long trips, especially if you are not traveling by car, where there is always a possibility to recharge a mobile phone. Cases VITAHULT presented in the catalog IKEA range and perhaps fit to any make and model of phone. The device is certified and meets all modern requirements Qi standard.